The origins of the AKFF blog were anything but typical. AKFF started 10 years ago in Venice where things don’t go on the straight and narrow. See this post for the start of @abbotkinney1st. Our Editor and Founder, Janet Gervers of Jagmedia in Venice was working with the Venice Chamber and the Venice Neighborhood Council at the time to promote Abbot Kinney First Fridays on Abbot Kinney Bl in Venice, when the attendance was a handful of people. 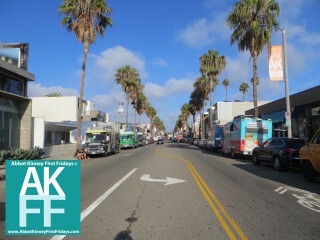 Our Editor had the idea of creating a blog that promoted Abbot Kinney First Fridays. She discussed it with one of the Venice Chamber Board Members who was very supportive of the idea and it was launched in a short time in May of 2008 promoting First Fridays. They both spread the word to Abbot Kinney businesses. There was opportunities for free and low-fee advertising, something needed to sustain blog. The Abbot Kinney First Fridays blog helped to sky rocket attendance within a year of starting which led to international prominence! It was really shocking that an insidious email was sent over the weekend making the blog effort akin to a crime by Carole Tantau, owner of Just Tantau on Abbot Kinney and a Venice Chamber Board Member, directly familiar with the efforts of our Editor, who was actively promoting the event and volunteering on her own time for it. The email was sent to Board Members of the Venice Chamber and the Venice Neighborhood Council claiming that our Editor and a Board Member who was supportive of the idea were in some kind of nefarious collusion and did her best to try to shut the blog down. Fortunately, the majority who were emailed did not agree with her and the blog continued. In fact no effort was made to open any kind of dialogue at any time past or present. It was really distressing and hurtful to our Editor to have these accusations made when she had put much effort into helping the community and something that would benefit the businesses on Abbot Kinney (and still does). While this is not intended to be vindictive in any way, the truth finally needs to be told. This blog does NOT benefit from food truck booking revenue, it’s a local merchant group. This blog has been an all-volunteer effort since the start 10 years ago and it exists via advertising revenue. Our Editor is grateful to have had the support we’ve had from local businesses over the years. Moving forward, the AKFF Blog is planning on putting the blog on the Patreon platform that will allow people to subscribe to get premium content and perks so we can continue our blog for you, our valued readers who appreciate what we do and love First Fridays. The advertising models of the past don’t work as well and we hope that you will move forward with us and support us so that we can continue bringing content not only about First Fridays but also food, culture and events in Beach areas, West Los Angeles and beyond – plus perks only for our subscribers. If there’s something else that you would like to see on our blog, make sure to click in the reply area below or fill out our contact form. We’d love to hear from you!